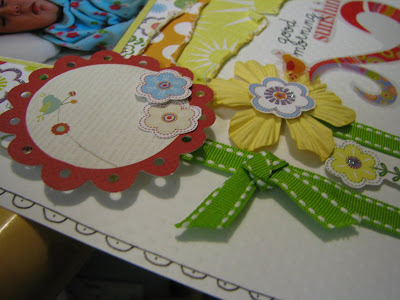 Butterfly Crafts June Sneak Peak and other things! It is finally sunny today! It has been raining and gloomy all week in Chi town unfortunately. So my DH got my new jogging stroller (not actually new since it is from a garage sale, but new to me) and hosed it off really good in the back yard. It is drying in the sun right now. I can't wait to take Frances for some morning jogs around town. Also the two ducks who took up residence in our back yard had their babies! Well actually I guess the eggs hatched. The ducks were walking across the yard with all the ducklings this morning. It was so cute! I grabbed the camera ran out there and started clicking away, but then noticed nothing was happening. Ughhh, no batteries in the camera! So hopefully they will be back and I can take some pics later. So anyway the whole point of the sunny day is that I finally got to take some pictures of my June Reveal LO for Butterfly Crafts. 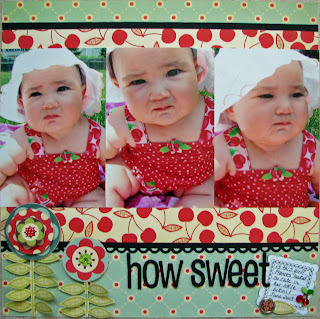 It was such a fun challenge and I had so much fun making the LO. I have to give a huge thanks to Karen for coming up with such an awesome challenge! Here is a sneak peak! Check out the challenge on June 1st! And lastly- the June/July issue of Ready, Set, Create just came out! I have three layouts in this issue- "I hate tummy time", "Happy", and "So tiny, so perfect, so loved". "I hate tummy time" is in the color combo section and the other two are in the reader gallery. 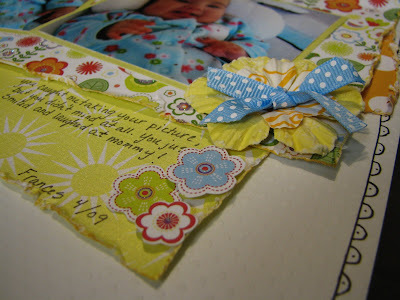 There are so many fun projects and LO's in there. And really this is the last thing- Don't forget to check out the cyber crop going on at Scrap That! There are so many fun Make N Takes and challenges with prizes! Everyone is having a great time so come join us! 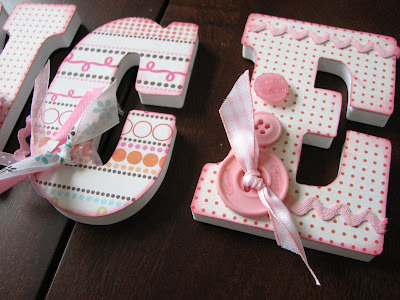 I bought some plain white letters at Joanns to put in Frances's room in January! 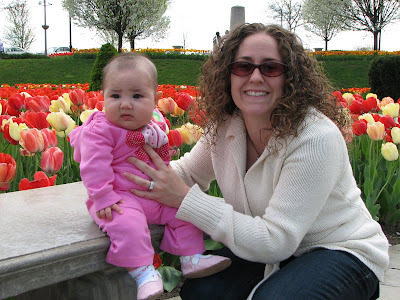 I think it was one of our first outings together when she just a few weeks old. They have been sitting around forever and I kept putting them on my list of "to do" projects. Well, I noticed the other day Frances is looking at all the decorations on her wall all the time now! There is a monkey border that she just loves looking at. She looks at it and laught and laughs. It is so cute! So I thought I better get those letters on the wall! So here they are. Her walls are pink so I tried to make them pretty light colored to pop against the pink. I hope she likes them! Online Crop at Scrap That! This weekend kicks off the Spring into Summer Crop at Scrap That! If you haven't visited Scrap That! yet come on over and join in the fun. It is a super friendly forum with tons of talent. I am hosting a "Favorite Summer Thing" LO challenge. Just like it sounds scrap one of your favorite summer things! This is the super simple LO I created about Wrigley Field, one of my favorite places to watch a ball game in the summer. My favorite thing about it is the stitching. It is the same stitch as on a baseball! Along with challenges from the design team there is also going to be games, make N takes, and specials in the store all week. This is my latest LO of sweet Frances sleeping in her car seat. She always sleeps like this when I take her out of the car with one hand on her cow. I love these pictures because they show a part of our everyday life. I like posed shots, but my favorites are the candid "Oh she looks so cute sleeping in her car seat, I am going to grab the camera" kind of pics. To everyone else these may not look like the greatest pictures, but when I look at them my heart melts. Part of me wants her to stay like this forever and I think "Boy, pretty soon she won't even fit in this car seat anymore! Where has the time gone?" I always wonder what she thinks about and what she dreams about so I journaled about that. The journaling also shows some of the things she is doing right now. All my other LOs are so sappy I decided to make this one bright and cheery with some fun journaling. So I also finished two other LOs that I mentioned in my last post. 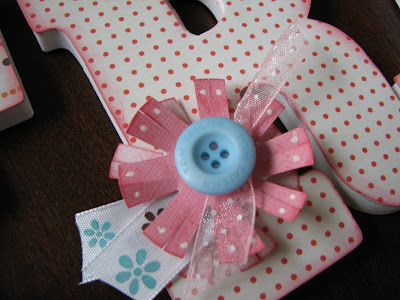 One is for a game of scrapbook tag at Scrap That! so I will wait to post that. 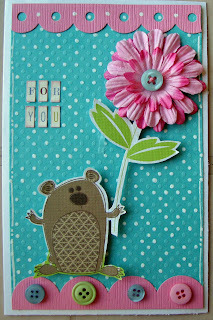 The other is for the June 1st reveal at Butterfly Crafts and it is a fun one. No Frances on this page. I will give you small hint- you will see a picture of me as a 10 year old (and it ain't pretty!). So stop by the sites and play along! I hope everyone had a great Memorial Day if you celebrate. Our weekend was very relaxing. 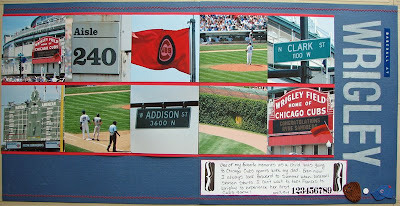 Ron was home from work and we spent the weekend taking care of the yard, having some BBQ's and I did some scrapbooking. This layout I completed from sketch 20at 52 weeks, 52 sketches. These pictures were taken on Mother's Day. I love the look on Frances's face on these pics! So cute! I did a few other LOs too, but I can't post them right now. More on that later. I Love Being Your Mom All the paper and rubons are Piggy Tales. I won the Piggy Tales Earth Day photo contest last year and never used any of the great stuff they sent me! So I am trying to make a dent in it now. I made the flowers from paper and will post directions on those later. Also the May issue of Scrapbook News and Review came out today. 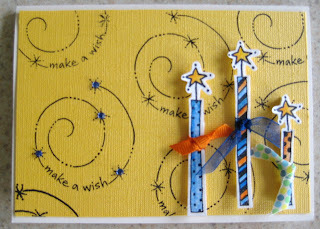 I have two cards featured in this issue, Make a Wish and With Love. I was so excited to see my cards in there! I was just asked to be a part of the Butterfly Crafts Design Team! 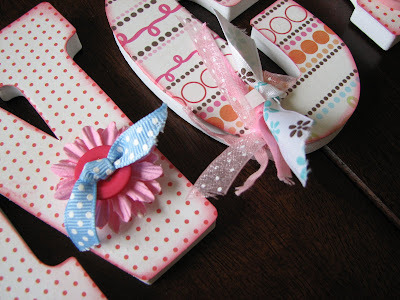 Butterfly Crafts is a fun challenge blog with new challenges on the 1st and 15th of the month. I will be creating for the 1st of the month challenges and am super excited! I just received my first challege today and it is a fun one! Make sure to check to the blog on June 1st and play along. They also have a great friendly forum so definitely check that out too. 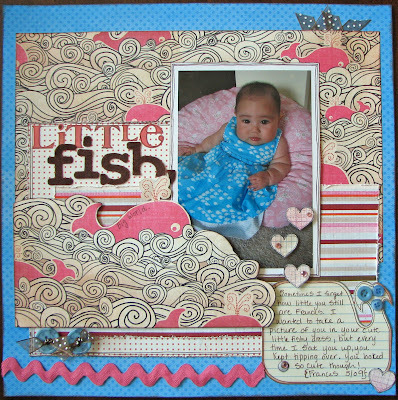 I made this layout yesterday of my dear Frances in her little fishy dress. I just love this dress so much I couldn't wait for her to wear it! I love the color on her and the little schools of fishys. I decided she would wear it on Mother's Day and I dressed her up in it and took her picture and then about 30 minutes later it got dirty when her diaper leaked :(. Luckily I took these pics of her before the incident. Sometimes I forget how small she still is! I wanted her to sit up for the picture so I propped her against this pillow, but she kept tipping over. She finally had enough and we had to end picture taking. She kind of looks like she is posing in this one though doesn't she? My little Frances, the model already. I spent all day Saturday at the crop and I have some new LO's to share. My little Frances is sporting a mini mohawk these days. When she was born she had so much hair all over her body. She looked like a little monkey. It all fell off and now it is growing back in patches on her head. The middle is long and spiky and looks like a little mohawk. I couldn't get my good camera to work for some reason so I had to use my little cheap one so the picture is a little blurry. The mohawk looks much better in the actual photo. I thought the title looked a little like a mohawk too! The next couple of LO's I created with my DT kit from Scrap That!. This month we were given products from the Basic Grey Ambrosia line. That paper is so bright and fun. I thought it looked good with the tulip photos we took a few weeks ago. 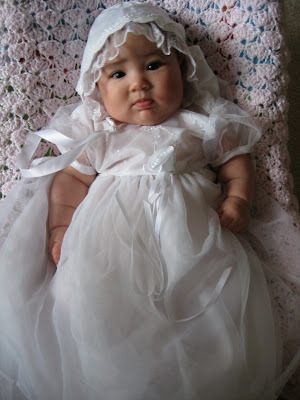 I also used it for one of Frances's baptism photos. I thought she looked so cute in her little gown so I wanted to do a LO that was non-baptism related for one of the photos. Don't worry I have plenty of her crying to scrapbook later! I had a great day today. I spent the entire day scrapping with my friends Linda and Kathy (Hi Linda!). I just finished my three LO's with the May DT kit from Scrap That!. This month we were working with the colorful Ambrosia papers and they made some cute colorful LO's. I will be posting them tomorrow. 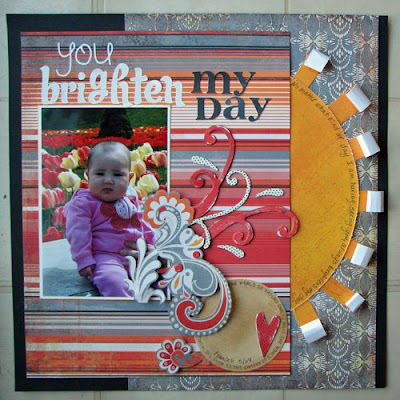 Then when I got home I saw that my "Play" LO was chosen as DT LO of the day at Treasured Scrapbooking and my "Good Morning Sunshine" LO was chosen as member LO of the day at Treasured Scrapbooking. That really made my day! 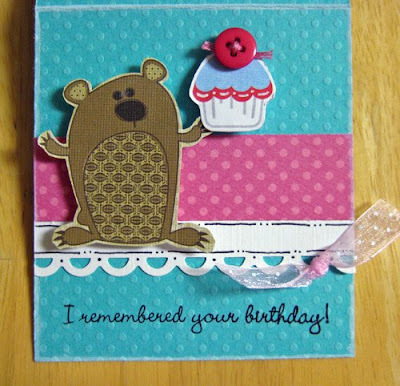 It's my friend's bday soon so I made this quick card from left over scraps. I love this little guy! I keep thinking what else I can do with him. And it's the LOST season finale so you know where I'll be tonight. Enjoy! 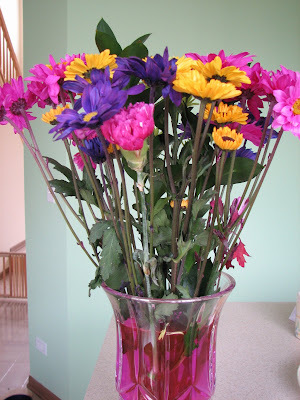 Mom's Day, Paper, Doodling and Flowers, Oh My! My special Mom's day flowers. Look at how the water turned purple. I thought that was so cool! 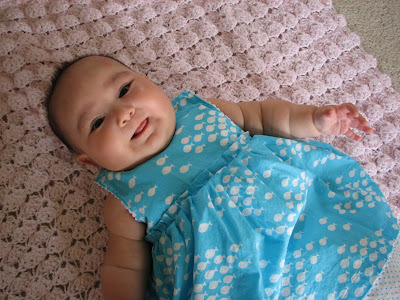 Frances in her "first" mom's day dress. Frances in her "second" Mom's day dress. We just both woke up from our nap. Can you tell? Now for the scrappy stuff! I have been seriously obsessed with pattern paper, doodling and flowers lately. I keep buying paper like I don't have any (ha ha) and doodling on everything. And I just found the Prima aisle of Michaels and bought like a zillion flowers. So that's what my LO's look like lately. 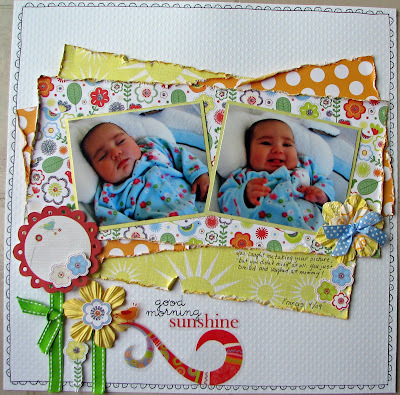 For this LO, I knew I wanted to use the title "Good Morning Sunshine" for these pictures and when I saw that cute MME transparency I knew that would be used for my title. It said "You are my Sunshine", but I just cut off the "You are my" part. 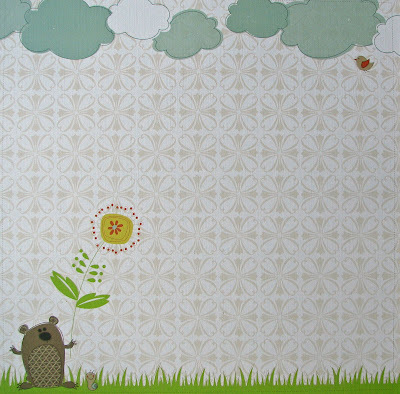 I used this super cute paper from the GCD spring all over and Margarita lines. Don't you just love the flowers and suns? It is really shiny and glittery too. The paper looked really flat so I used a steak knife, yes that's right, a steak knife, to distress the edges. It worked so much better than my edge distresser. Just put the edge of the paper into one of the grooves and drag the paper. Really gives a nice frayed edge. Then I layered all my embellishments and used some rubons to finish off the title. And of course I had to add some doodling around the page (I actually did that first)! My second LO "My New Friend" I created using sketch 18 from 52 weeks, 52 sketches. My Aunt bought this bear for Frances and I gave it to her and she held onto it! I say it like it is the most amazing thing, but for me it was because she never held onto a toy before. I just loved the way she was looking at it and smiling at it. She was "talking" to him too in her own Frances language. To make the big circle I used one of my kitchen bowls to trace and then cut it out. See you don't need any fancy templates! To hide the cut lines I just distressed the edges a bit. I doodled around the whole page with that fun swirly design. I sketched it in pencil first, drew over it with my pen and then erased the lines. Great way to doodle because if you don't like how it looks just erase it! 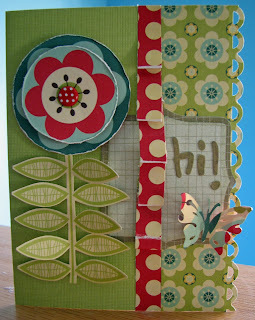 Then I cut up my sassafras paper and added some fun little ebmellishments to them. I used to be so afraid to cut up paper. I always worried I would make a mistake. Silly me. Now I just cut away and it is so much fun. I doodled with a white pen on the flowers and stitched a few. 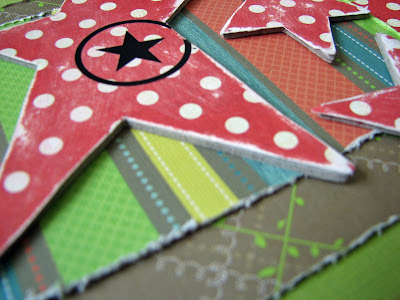 Then I layered them all with pop dots and added the finishing touches. This was a really fun LO to make. It makes me feel a little sad when I look at it though because it was just a month ago and Frances is so big now and holding onto all her toys. She is growing so fast! Mother's day is this Sunday! Can you believe it? I am very excited as this is my first Mother's Day. My sister called and said since it was my first I could pick where we go for brunch. That's a lot of pressure! So I was in the Mother's Day mood yesterday and thought I would make a cute little card for my mom. I used the scraps left over from DCWV Green Stack. That paper is so cute! I love all the little animals. Such fun paper. "That's a cute card, can I have it?" I kind of think he was serious about that too. At least the present part. Anyway back to the card. I liked the design in the middle of this paper so I cut it out and used it on another LO. I had the little guy on the bottom left over and I didn't want to waste him. I cut him out and used pop dots to adhere him (or her) to the cardstock. 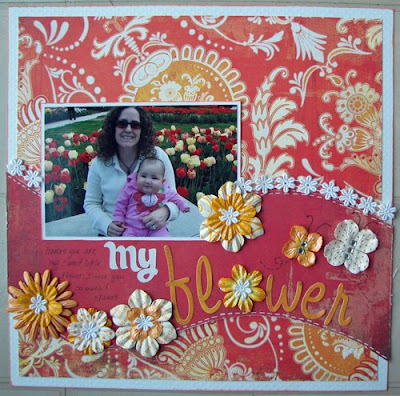 The flower didn't pop enough so I layered the three prima flowers and added a button to the middle. It was still missing something so I added the scallops, buttons and white doodling. The little MM stickers say "For You"
Have a great Mother's day all you mother's out there. You deserve it! 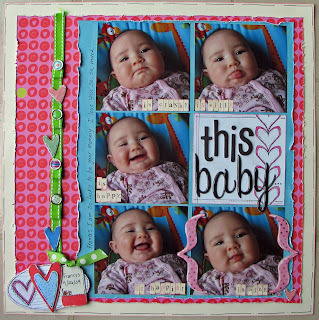 I created two layouts last week, but I can only post one because the other just got picked up for publication in the June/July issue of Ready, Set, Create! It is my new favorite layout too. It is titled "I Hate Tummy Time". So I think you can guess what that is about. Poor little Frances hates being on her tummy. She just cries and cries the whole time. The doctor said by now she should be able to lift up on her arms :( So I started giving her sneaky tummy time by laying on the floor and putting her on top of my chest. She likes to look at me and laugh and pull my hair. Oh and she likes throwing up in my face. Well maybe she doesn't like it, but I am pretty sure I saw a grin on her face. And not just a little dribble of spit up, a full on white curdled mess of milk. So I have gotten smart (it only took me like 5 times!) and now keep a towel close by. It doesn't stop the throw up from getting on my face, but now I can quickly wipe it away instead of looking around all over for a towel. The things us mothers do for love! I never thought I would be writing a story about a baby throwing up in my face, but here I am. My second layout was complete from sketch 17 at 52 weeks, 52 sketches. I have wanted to scrap this photo forever. 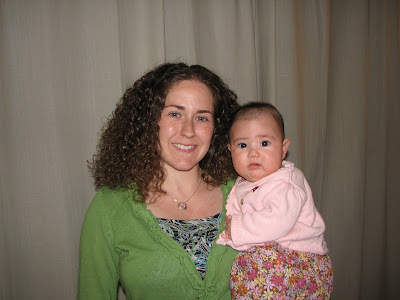 It is on the day Frances was born, thus the no makeup messed up hair look. 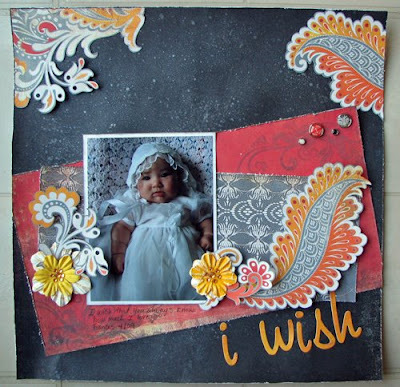 I used the GCD spring all over and Chic Bebe papers. I liked the papers and knew I wanted to use them, but wasn't sure how so I just started cutting them up and layering them. I also used some journal tags from GCD in the layers. The scallops around the word paper is from a scalloped piece of paper from the Chic Bebe pack. When I pulled the page out the negative edge was left and I didn't want to waste it so I used it to border the paper. The flourishes were stamped on pink paper (also GCD) and then I cut them out to fit. As always I had to add a little bit of pink so everyone knows Frances is a girl. I can't make that mistake again! I always use buttons for the middle of my flowers so I decided to do something different and used diamond glaze to glue some beads in the middle. I have to say this layout took me a lot longer than my usual LO's. I moved around the paper forever and went through my entire stash of prima flowers trying to find some I liked. My favorite part is the paper with the little animals. I love those animals! That was the entire reason I bought the paper pack.TFL! It was so nice this weekend! The sun was shining and we were able to take Frances out. We decided to take her to a little zoo by our house, and I mean little. There are only a few animals at this zoo. 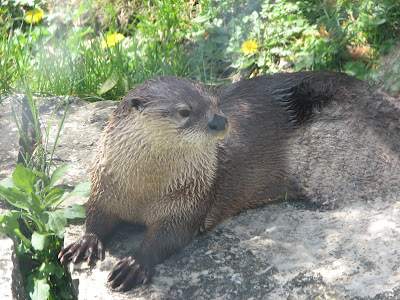 There are some otters, a fox, two mountain lions, an eagle, some wolves and a reptile house with some turtles an an alligator. You can pretty much walk around the whole thing in 15 minutes. 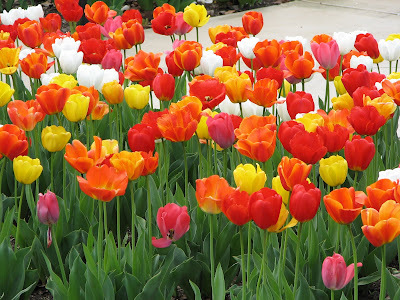 Right outside the zoo is a small garden were hundreds of tulips were planted. It looked amazing. Luckily Frances woke up just as we were leaving and we were able to take some pictures of her with the tulips. I wish she could sit up by herself. I would have put her in the middle of all those tulips and taken her pic! A friendly otter saying hello! 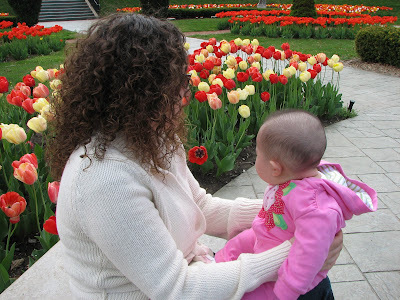 Frances and me enjoying the Tulips. Daddy must have snapped this when we weren't looking! It is a Saturday night, Frances is sleeping, the dogs are sleeping and my DH is sleeping. What I am trying to do? Finish my LO for this week's challenge at 52 sketches, 52 weeks. For some reason I have some serious scrapper's block. I have started two layouts and not finished either one. So I decided to write about Frances's baptism instead. So two Sunday's ago was Frances's baptism. She lookes so cute in her little gown. Like a princess from a fairy tale. Anyway, everyone came over to my house at around 11am and the baptism started at 12:30. Well Frances usually takes her nap at 11:30 and with everyone at the house I knew she wouldn't take it. I knew that would mean trouble later, but what could I do. So we all get ready and take off to the church. The baptism starts and Frances is being very good in my lap. About 20 minutes into the service she starts sucking her hand and burying her face in my shoulder. OH NO, I think. This means she is tired and when she is tired she cried. Right on cue, she starts crying, LOUD. Everyone in the church is looking at us and she just won't stop crying. I rocked her and swayed her and tried everything and finally she fell asleep in my arms about ten minutes later. Not that big of a deal right? This is a baptism, there are babies here, babies are expected to cry. Let's just get on with the baptism. Right? No. Of course not. Not with my crazy family. So just when I think the worst is over and Frances is sleeping quietly in my arms. I hear a cell phone ringing. In my mind I am thinking "what idiot has a cell phone on in church?". And it keeps ringing. And it keeps ringing. I am thinking glad that is not my phone. Then I hear my dad say "Hello, I can't talk right now. I'm in church at a baptism. I'll call you back later." Then I hear a lady a few pews back say "I can't believe this". Then my sister leans forward and says "I don't think you can come back to this church anymore." So of course my family has to have the cell phone go off in church and actually answer it! But the rest of the day was great and look how cute Frances is!